FL-41 is a lens tint that has been shown to reduce the impact of migraine attacks in clinical studies. But what does FL-41 tint look like? Are all FL-41 glasses the same? The short answer is no. 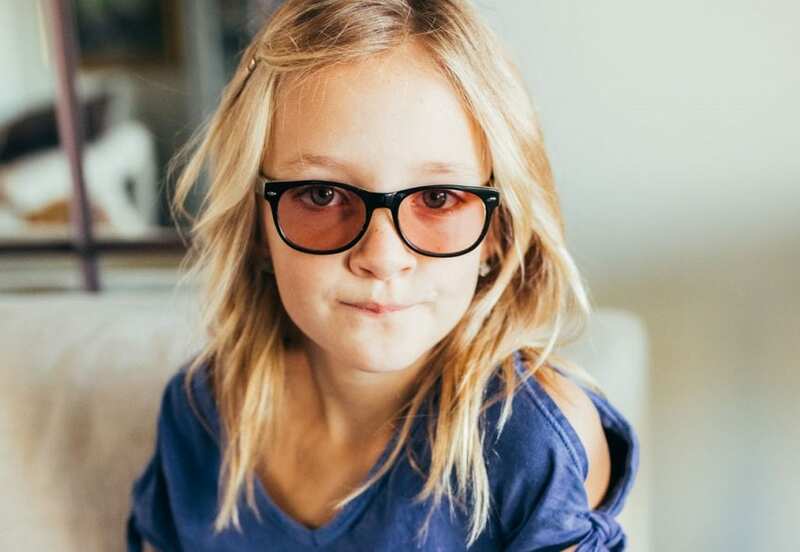 An early research project from the University of Utah Medical Center evaluated whether patients were getting the same benefit from therapeutic lenses (or lenses with FL-41 tint) from different vendors. Surprisingly, the study found wide variations in the quality, lens color, spectral characteristics, and optical densities of lenses purchased from different optical shops and laboratories. 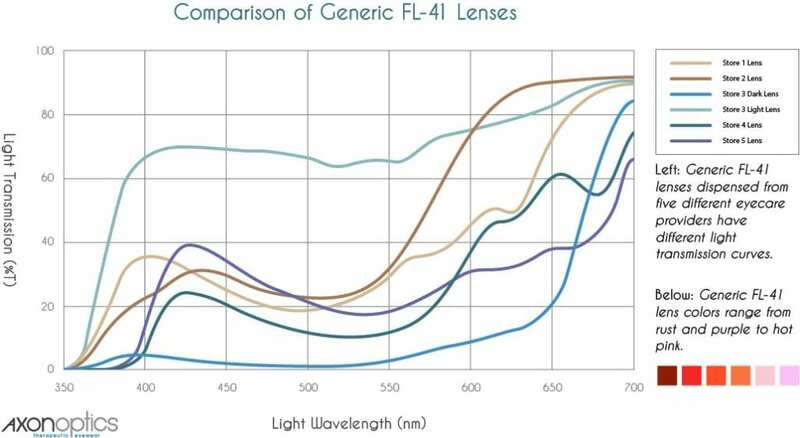 Each line on the graph below represents FL-41 lenses from 5 different vendors. The light shows how much light passes through the lens at different light wavelengths. As you can see, they vary significantly. Even the color of the lens ranges from rust. to purple, to hot pink. How are Axon lenses different? 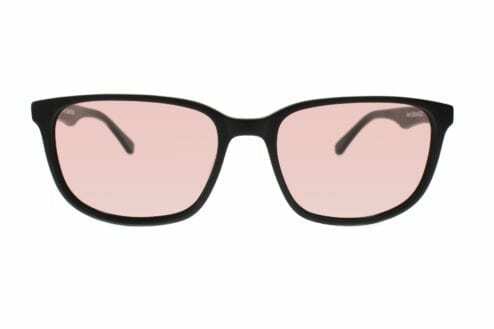 Lens Technology: Our indoor lens is a soothing rose color, and the outdoor lens is similar to sunglasses. Other companies that came later offer a generic version that attempts to imitate, but fails to replicate, our product. Most others are an orange/rust color. 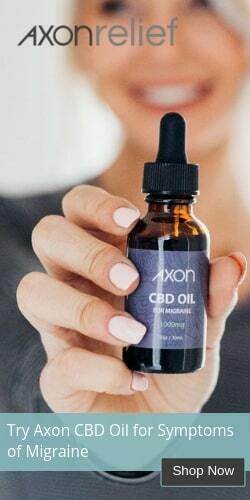 Advanced Coatings: Only Axon Optics includes advanced optical coatings for anti-glare, anti-smudge, anti-scratch with every non-prescription lens order. This is a $60 value. Packaging: Every frame comes with a case and cleaning cloth bag. How should I choose a therapeutic lens? Look at the research and consider the source. Axon Optics was founded by researchers at the University of Utah. One of the founders, Dr. Bradley Katz, is a neuro-ophthalmologist who has worked with thousands of patients. He has been recommending and perfecting therapeutic eyeglasses for patients with light sensitivity for over 15 years. 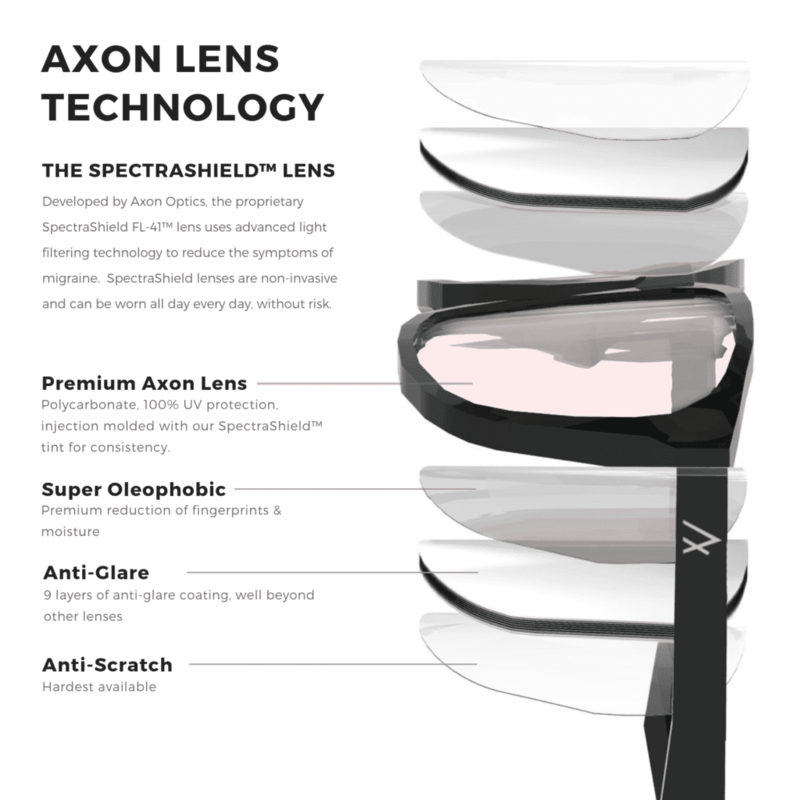 The Axon lenses, called Spectrashield FL-41™, have been used by tens of thousands of people and have been shown to reduce the impact of migraine in over 90% of users. 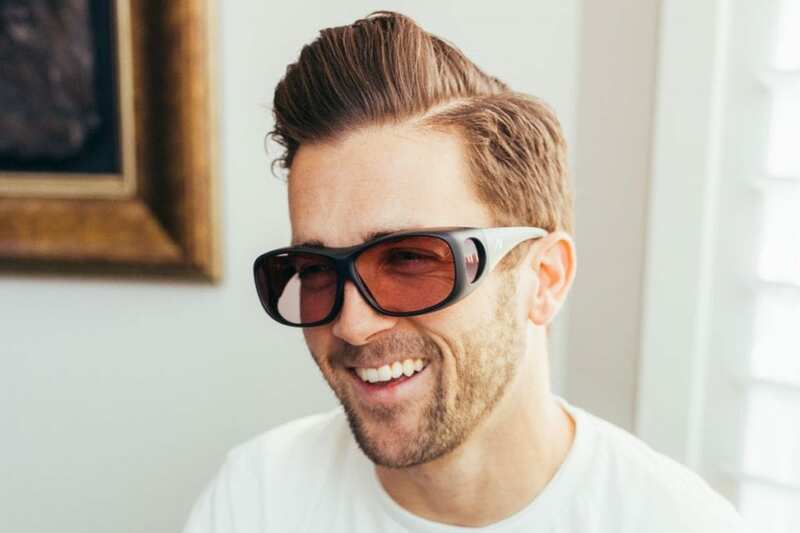 Our Spectrashield FL-41™lens is proprietary, and has been fine-tuned over the last 20 years many years by Dr. Katz.Each lens comes with premium coatings that block glare and prevent finger smudges and scratches. Don’t choose generic lenses. Not all FL-41 lenses are created equal. Get the trusted name in therapeutic eyewear. 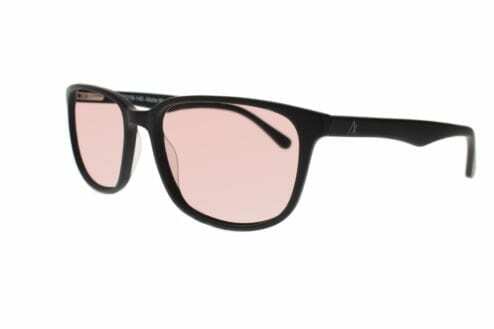 Check out our stylish frames now at axonoptics.com/shop. Hi Grant! Our tint isn’t clear, but we are continuously re-formulating our tints to appear lighter and less pigmented in appearance while providing the same or greater levels of protection. Our SpectraShield proprietary tint filters out the portion of the light spectrum which has been proven to bother light-sensitive people. We hope you’ll try our current version, which is lighter and less pigmented in appearance than earlier versions. You can try it risk-free – please read our Return Policy for details on how to trial our product for one week. If it doesn’t help, you can return a non-prescription lens in our frame from a full refund minus shipping costs. I would like the Spectra Shield FL-41 lenses to fit over my regular glasses when inside due to sunlight and fluorescent lights.. I don’t see where to order them now. I thought I saw them for$100. Do you have a glass that goes from somewhat light to dark in the same pair of glasses? I suffer from severe photophobia both indoors and outdoors (the worst) due to severe migraine. I want to buy the correct pair for myself. 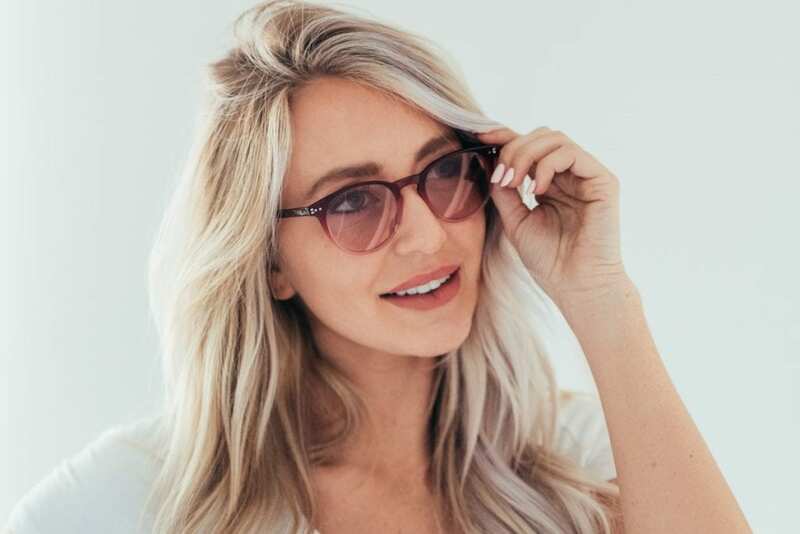 A Transitions lens can be a good option for some people. They do darken outside and double as a pair of sunglasses. The darkening transitions element within the lens won’t impede your regular vision, indoors or out. However, it is important to know that transitions only darken when directly exposed to UV light. They do not darken in bright indoor light or inside cars. Even outside it will not feel as dark as sunglasses or our outdoor tint. The baseline indoors is a very light pink tint. Transitions may take up to 5 minutes to fully “transition” from indoors and outdoors. Transitions are more reactive or transition faster in cold weather. Indoor temperatures and warm outdoor weather will be slower. Also, our SpectraShield FL-41 tinted lenses with premium coatings will be comparably slower than other transitions that are not tinted or coated. Transitions are available without the coatings if you prefer, but most customers opt for 2 separate indoor and outdoor frames.